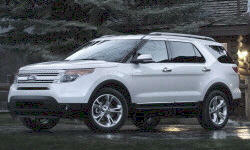 See TSBs and recalls for the 2012 Ford Explorer. 17700 mi Defective pillar mouldings Driver's power seat not sliding smoothly when going backward. US $300 Carriage bearing failed on passenger drive shaft. Replace drive shaft, seal and carriage bearing bracket. US $320 Both top front strut brackets had to be replaced. 30000 mi this is my 2nd replaced battery, 3 in total. US $350 Drivers side rear brake caliper froze up causing it to smoke and make noise. 1020 mi At 140 km/h a vibrating noise was generated by the windshield. after consulting with the dealer, he indicated that was a not frequent but known outside side frame issue. What they do is detach and reattach for a firmer fit. Took 4 hours. 3800 mi Back led running lights were not working. Burnt. US $700 A.C. Compressor seized up, burned up the serpentine belt. Compressor blew a quarter sized hole in underside. Replaced compressor and recharged system. 1600 mi Side mirror condensation in LED Driver's - side mirror LED panel window has water/condensation inside. 7300 mi Rear wiper inoperable Ford Sync System shut down. Dealer installed SOP module and replaced APIM module and program. C $120 Lost a piece of outside windshield trim. Changed windshield earlier, and pins get broken when this is done. Need to replace trim when replace windshield. C $50 Lood noise, change rear wheel bearing All 4 doors where squeaking...Dealer said sand was in the rockers...We did just one trip in a sand area with the truck!! US $150 Touch pad for electrical locks did not function properly and was replaced. US $135 Right-front Wheel bearing replaced. Dealer also had to replace the front axle since there was a new part from the manufacturer that couldn't be used with the original axle. 4000 mi The A-pillar trim piece was slightly faded when I took delivery of the car, so this service was scheduled to replace it at no charge. 7000 mi Door panel keypad shorted out, causing door locks to constantly lock / unlock until battery died. 11000 mi Car would not start, error code "Ignition System Fault" on the console. Dealer said the security code in the key was throwing errors. Also said battery was throwing errors. Replaced key and battery. 15000 mi SYNC system black screen on update. Couldn't reboot. 50700 mi Battery stopped charging, had to be replaced. 22300 mi Warnings displayed regarding "service advancetrac." Nothing was done as dealer could not reproduce and said there was no sign of error stored in computer. US $390 Clunking noise at slow speeds; dealer replaced failed strut bearings. US $350 Rear view camera became inoperable and had to be replaced. 37000 mi Not shifting it to park occasionally. 25000 mi This is the second time that the seat belt buckles have broken. The buckle does not break but the plastic casing around the buckle falls off making it hard for the kids to buckle themselves. Ordered a part. 32000 mi Battery died. Dealer replaced the battery under warranty. See our lemon odds and nada odds page to see vehicles with no repairs or vehicles with more than three repairs. To see how frequently 2012 Ford Explorer problems occur, check out our car reliability stats.